The Maltese Archipelago comprises a group of small islands located in the central Mediterranean between, latitude 35° 47' 06" and 36° 05' 00" North, and longitude 14° 11' 00" and 14° 34' 42" East. The islands covering a total land area of around 316 Km², lie at a distance of 96 km from Sicily (Capo Passero) and 290 km from northern Tunisia (Cap Afrique). The Maltese islands, like most other southern Mediterranean islands, are bereft of sufficient natural water resources as a result of a semi-arid climate characterised by low rainfall and long hot summers. Because of unfavorable geological and topographical conditions, most of the rainfall which falls in sporadic and violent showers over short periods, runs off to the sea before it has time to seep into the ground. Infiltration is estimated to be only 19% of the annual rainfall. Malta has no perennial rivers - surface flow occurs in small streams which appear during winter and early spring. Naturally occurring freshwater resources are therefore limited. The country has been heavily dependent, for the past 30 years, on desalination means of water supply to supplement groundwater abstraction, and meet consumption requirements. Today, the most reliable source of supply in Malta is desalination by Reverse Osmosis (RO) which accounts for about 60% of the total production of 125,000m³/day. This is of course a costly and energy-hungry process. RO water costs 1.1 US$/m³, 50% of which covers power consumption. WSC is in fact the major consumer of electricity in the country by employing, for RO production alone, more than 17% of the total energy generated by the state-owned Corporation Enemalta. Malta has no petroleum resources (as yet) and hence all fuel requirements to operate these plants must be inevitably imported - a major setback on the national balance of payments. There are four Sea Water RO facilities and one small Brackish Water RO facility, altogether having a maximum capacity of 114,000m³/day. The most recent facility, commissioned in 1991, is that located at Pembroke. It is indeed the largest of all, with a potential production capacity of 54,000m³/day. The Pembroke facility has brought an end to repeated water supply shortages which were hitherto common in summer with the increased influx of tourists. Today the Maltese infrastructure is backed by spare water production capacity which can meet demand even during peak periods of consumption. Yet another source of supply is that derived from the aquifers. Groundwater today makes up for 40% of the daily supply, and, albeit its quality limitations, is considered to be a strategic resource. Therefore the conservation of the integrity of the aquifers is one of the national priorities, since this natural source of fresh water is by far the cheapest one available on the island. 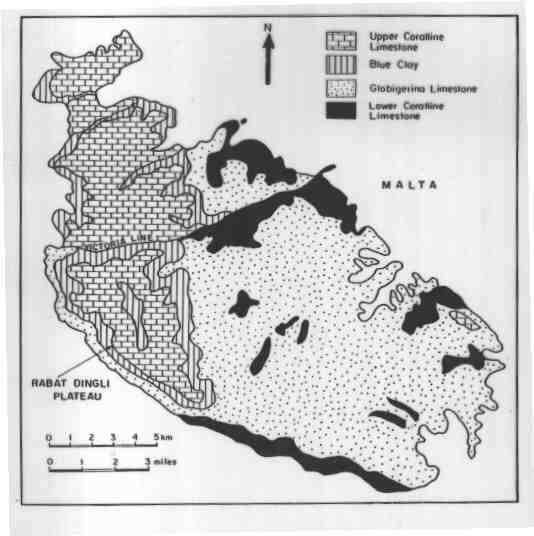 The geologic strata of the Maltese islands are mainly composed of tertiary (Oligo-Miocene) limestones, marls and clays stacked in horizontal succession. Quaternary deposits are restricted and limited. Two types of aquifers are found. The Upper Coralline Limestone, seated on top of the impervious Blue Clays, forms a number of small perched aquifers mainly confined to the north western regions of the islands. The Lower Coralline Limestone forms an extensive Mean Sea Level Aquifer spreading beneath 70% of the whole territory. It consists of a mass of fresh water floating on heavier saline water, with its thicker parts occurring beneath the western regions known as the Rabat-Dingli Plateau. The aquifer stretches from west to east reaching a maximum potentiometric level of 3.5m above sea level while it gradually tapers out towards the shoreline. Natural replenishment is typical for fracture limestone, occurring mostly through faults, fissures, and an intricate network of karstic channels. 96 boreholes and 9 pumping stations which drain 37kms of galleries sunk in the Mean Sea Level Aquifer (98%). several springs in the perched aquifer. (2%). private wells sunk in the Perched and Mean Sea Level Aquifers. Treated sewage effluent is another source of water which today is marginally tapped for purposes other than potable. Around 10,000m³/day or 10% of the total sewage production, are treated to tertiary stage, at the San Antnin treatment Plant, the product being utilised for the irrigation of crops which are not consumed raw, and also for industrial requirements of the Bulebel Industrial complex. In a country with limited natural resources, hydrological monitoring is one of the most essential tools for the rational management of water resources available. Today, the institutional framework to support the water resource management system is provided for by the Water Services Corporation Act 1991 which led to the establishment of a public corporation in January 1992, to perform integrally all the activities concerned with supply and demand in full cognizance of environmental constraints and national socio-economic requirements. This Corporation will also be responsible, once the relative parts of the Act come in force, for waste water collection and treatment. Since October 1996, the Water Services Corporation became part of the portfolio of the Minister of Public Works and Construction, Mr. Charles Buhagiar A&CE. Within the Corporation and previously forming part of the ex Water Works Department, a "Hydrology" unit is assigned the responsibilities of groundwater monitoring and protection, hydroclimatological monitoring, abstraction control and quality monitoring. Data collection, preparation, entry and verification is fully carried out in house by a small team of technicians and engineers. The unit provides support services to other Government Departments, namely the Planning Authority, the Ministry of Health, the Ministry of Agriculture and the Ministry for the Environment, on issues concerning water resources planning. 12 rain gauges covering the whole Maltese territory. 40 gauging wells sunk in the Mean Sea Level aquifer. Two stations monitoring surface run-off in two different water-sheds located to the west and east of the island of Malta and a third surface run-off recorder in the island of Gozo. The hydrological monitoring network is expected to be enhanced by the installation of a Med-Hycos DCP to monitor the largest surface-watershed in Malta (shaded red on Picture 2). It is locally known as the Wied il-Kbir catchment and is heavily urbanised near the discharge point around Marsa, the location where the DCP will be installed. The area is prone to serious flooding during heavy rainfall.